Home › The Bible Re-Viewed › What Can We Learn from the Story of Elijah and Elisha? 2 Kings 2:1–18 tells the fascinating story of how the great prophet Elijah passed on his mantle, and with it his prophetic power, to his student and successor Elisha—who then went on to be a great prophet in his own right. To get the full flavor, I recommend that you click the link and read the whole story before moving on. The events in this story took place more than 800 years before Jesus Christ lived on this earth, so is not a specifically Christian story. However, as with everything in the Bible, Christians can find great significance for their own lives not only in the story itself, but from the deeper message it contains. In this article we’ll look at some of the lessons this story contains plainly for anyone to see. In a second article we’ll dig deeper, and look at its spiritual significance. A few chapters earlier, in 1 Kings 19, the prophet Elijah was hiding out at God’s holy mountain, called Horeb or Sinai. He feared that Ahab, king of Israel, would kill him because among other things, after a dramatic demonstration of the power of the God of Israel, he had slaughtered 850 prophets of the pagan god Baal and goddess Asherah, favored by Ahab’s Sidonian wife Jezebel (see 1 Kings 18). But now God told Elijah to leave his hiding place, return to the north, and anoint Elisha to be his successor as prophet (see 1 Kings 19:15–21). From that time onward, Elisha followed Elijah, serving him and learning from him as his disciple. We don’t know just how long Elisha had been Elijah’s servant before he became his successor. But clearly, Elisha had formed a strong bond with his master. In the story of 2 Kings 2:1–18, three times Elijah told Elisha to stay behind while Elijah traveled to another place. Each time, Elisha refused, and stuck by his master’s side. As he traveled onward with Elijah, the local “company of the prophets”—something like a prophets’ guild—came out and told him that his master was about to be taken from him. This, Elisha told them, he already knew. For Elisha, it was a bittersweet journey. He knew he was to become Elijah’s successor. And yet, he knew that for this to happen, he had to lose the great man that he looked up to. It might have been easier for him to avoid this painful event and stay behind, as Elijah urged him to do. But he was determined to see it through to the end. And here lies the first lesson in this story for Christians—and for anyone else on a spiritual path. Did Elisha have the dedication and strength of character to follow his own calling despite pressure from the man he revered? Could he overcome both outward resistance and the heaviness of his own heart? These days, especially in the wealthier countries, young people get used to having things handed to them on a silver platter. Everything is made as easy as possible for them. All obstacles are cleared out of their path. They grow up thinking that the world exists to serve their needs. But once they hit adulthood, there is a rude awakening. They discover that the world doesn’t consider them special at all. Once they leave the protective cocoon of their parents’ home, they find that nobody is interested in giving them anything. They have to work hard just to meet their basic needs. Many of them sink under the weight of an uncaring world that they were never prepared for. Elijah’s approach was very different. Elisha became a servant to Elijah. Instead of being cared for, he had to take care of his master’s needs, pouring his water, washing his feet. He had to endure the same hardships Elijah did. Before Elijah could pass on his mantle, he had to be sure that Elisha had enough iron ribbing in his character to withstand the harsh challenges of being a prophet of the Lord in a hostile world. Right to the end, he tested him to see if he could be too easily turned away from the hard road he must travel. Similarly, the life of a true Christian is not an easy one. We will be repeatedly tempted to stay where we are instead of moving forward on the difficult journey ahead. But if we wish to follow in the footsteps of Jesus Christ, our master, we must develop the strength of character to push forward despite every distraction, discouragement, and resistance. And yet, as Elijah ascended to heaven, his mantle (outer garment) fell to the ground behind him. Elisha picked up the mantle and gained his master’s power of miracle and prophecy. 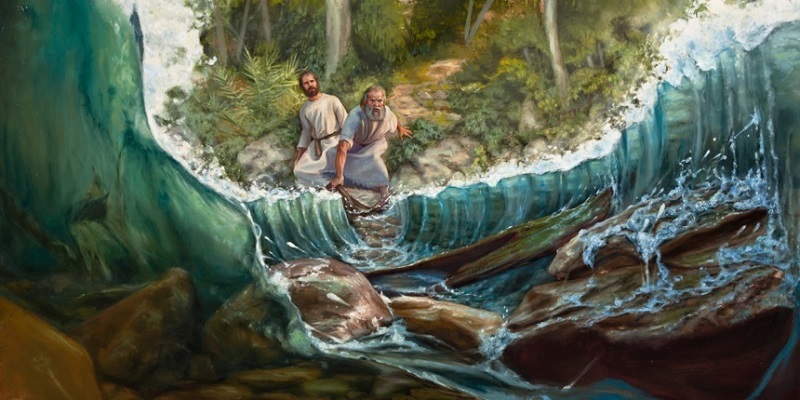 He immediately used the mantle to part the waters of the Jordan River and cross back over. The company of prophets recognized that Elisha was Elijah’s successor as the Lord’s leading prophet in the land. And Elisha went on to do many more miracles while wearing that mantle. The lesson for Christians clear enough. Our childhood and teenage years are a time of learning and preparing ourselves for the future. But the time comes when it is our turn to take up the mantle of leadership not only for our own life, but in our community and nation. That is what our elders have been preparing us for. And for Christians, this means more than just taking on economic, social, and political responsibility. It also means taking spiritual leadership and becoming a force for moral and spiritual good in the world. If we fail to pick up that mantle from our spiritual teachers, then we are not worthy to be called a Christian. Elisha knew his master was gone for good. But the company of prophets was not ready to accept it. They asked Elisha to let them search the region across the Jordan to see if God had dropped Elijah on some mountain or in some valley. Elisha told them not to go. They kept pressing and urging him until he relented. It’s a common saying—but much easier said than done. The company of the prophets was looking back to the familiar times of having Elijah as their leader. But now they had a new leader. And though Elisha had learned many things from his master, his style would be different. Elijah’s main mission was to stand up for the God of Israel against popular pagan gods such as Baal and Asherah. Elisha was more about doing amazing miracles and advising kings, princes, and commoners alike. Elijah was a lonely voice in the wilderness. Elisha was a man of the people. Elisha did not merely repeat what his master did. He had his own distinctive voice and mission as a prophet. Just so, when it comes our time to take up the mantle of leadership, our job is not to repeat what those before us did. Our job is to take up the journey where they left off, and move boldly into new territory—even if our parents and teachers might not understand or appreciate what we are doing. In the follow-up article, “What is the Spiritual Significance of the Story of Elijah and Elisha?” we will delve into some of the symbolism embedded in this story, and unearth a few of the deeper spiritual insights it has to offer. As an artist, it really irks me when fellow Christians can’t be bothered to credit the actual artist. Do a reverse image search, find the artist’s name, and give them credit. God did tell us not to steal, and when you use an artist’s work without giving him or her credit, it’s called art theft. You didn’t ask permission, and you didn’t pay for a license. Most of us let that slide if you CREDIT. Thanks for stopping by, and for your comment. If you are speaking of the artwork of Elijah parting the Jordan, I did do an image search, and found the artwork on many and varied websites, but did not find the artist listed anywhere, so I do not know who the artist is. If you are the artist, or you know who the artist is, please let me know (and ideally, provide a link to where the artist and title of the work are identified), and I will happily either give credit or take the image down. My general effort is to use only images that are in the public domain, but sometimes I make mistakes. If I have made a mistake in this case, I do apologize.